Summary: Recently the FM website has focused on the evolution of the America-that-Once-Was into the New America, and the propaganda that drives it. One of the great oddities of this is that we radically change, yet remain unaware of the change. Today we look at one example: Libertarianism, the anti-Christianity — so popular among Christian conservatives. 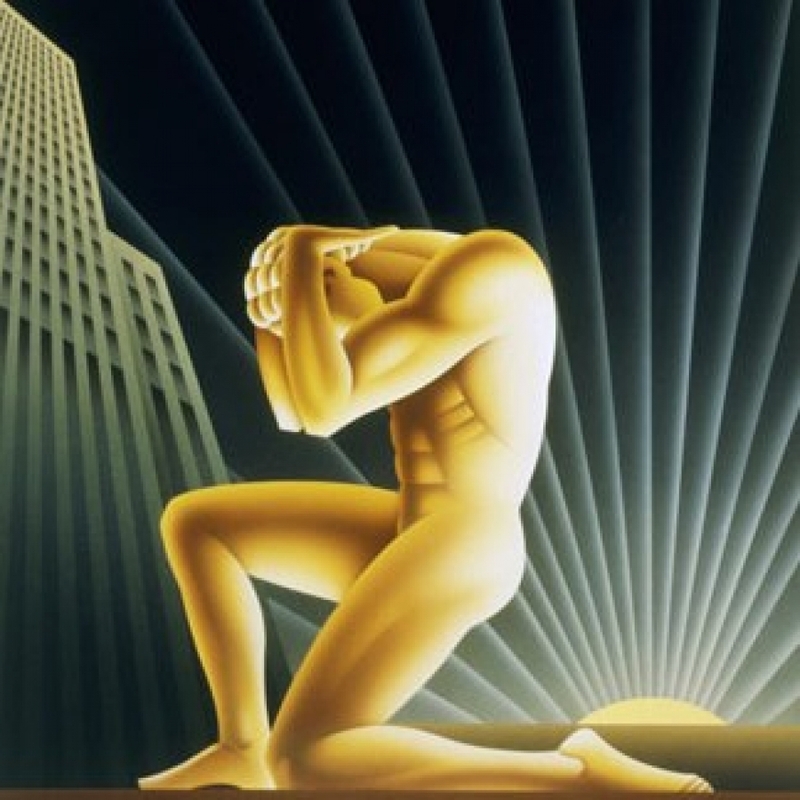 The profound differences between Christianity and Objectivism-Libertarianism (see section 4 for details) go far beyond the role of government — the subject which tends to obsess so many people today, but was not the primary focus of either Moses, Jesus, the Disciples, or Ayn Rand. All of these were very concerned with property, and the acquisitive instincts of the human soul. On this critical subject Christianity and Libertarianism are at opposite poles. Since America was, to a large extent, founded on Christian principles, the growing popularity of libertarian values is another factor driving the evolution of the New America. The following quotes illustrate the philosophical chasm across which much of America has leaped, the change in values and aspirations — which do, in often mysterious ways, deeply change people’s behavior and the way we structure our society. In a sense the deeds of a nation reflect the values of its people. If among you, one of your brothers should become poor, in any of your towns within your land that the Lord your God is giving you, you shall not harden your heart or shut your hand against your poor brother, but you shall open your hand to him and lend him sufficient for his need, whatever it may be. Take care lest there be an unworthy thought in your heart … and your eye look grudgingly on your poor brother, and you give him nothing, and he cry to the Lord against you, and you be guilty of sin. We know that we have passed out of death into life, because we love the brothers. Whoever does not love abides in death. … By this we know love, that he laid down his life for us, and we ought to lay down our lives for the brothers. But if anyone has the world’s goods and sees his brother in need, yet closes his heart against him, how does God’s love abide in him? To view the question in its proper perspective, one must begin by rejecting altruism’s terms and all of its ugly emotional aftertaste—then take a fresh look at human relationships. It is morally proper to accept help, when it is offered, not as a moral duty, but as an act of good will and generosity, when the giver can afford it (i.e., when it does not involve self-sacrifice on his part), and when it is offered in response to the receiver’s virtues, not in response to his flaws, weaknesses or moral failures, and not on the ground of his need as such. Both philosophical and political movements tend to develop factions largely indistinguishable to outsiders, but the subject of fierce debate among believers. Communism had Marxists, Trotskyites, and Maoists. Modern conservatism has Libertarianism and Objectivism. Generally speaking, the latter is more-or-less a subset of the former. He agreed with a Liberty magazine review of Heller’s book, saying that “There can be no question about the fact that Rand remains America’s most influential libertarian, with the possible exception of Milton Friedman, and America’s most influential novelist of ideas.” Extending this, Boaz characterized Atlas Shrugged as a libertarian book, and Rand as a libertarian who has done more than anybody in our time to introduce people to libertarian ideas. — “Libertarian vs. Objectivist Thinking“, Greg Perkins reporting about a book forum hosted by Cato Institute on 28 October 2009. Wikipedia entries on Libertarianism and Objectivism, Libertarian Christianity, and Christian Libertarianism. Recommended: “If Wishes Were Horses, Beggars Would Ride — A Pony!“, John & Belle Have a Blog, 6 March 2004 — One of the best political posts, ever. 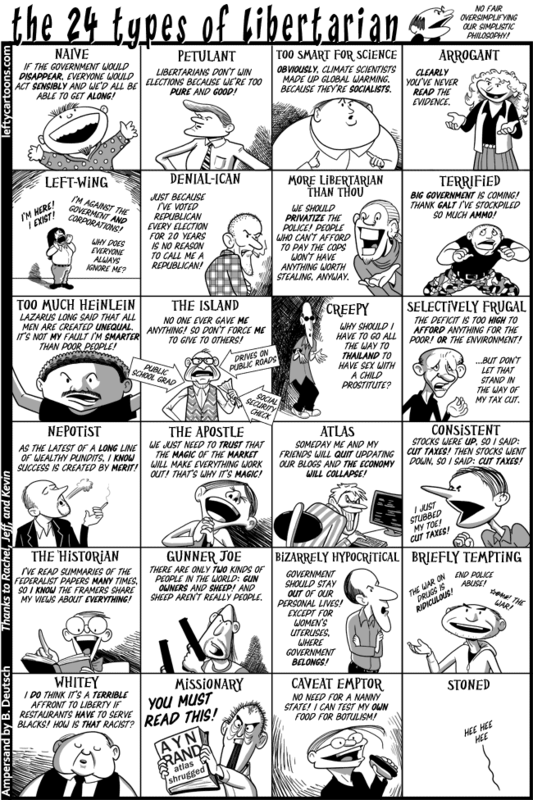 Where are you on the Political Compass — libertarian-authoratarian and liberal-conservative? Previous Post Has global warming increased the frequency & virulence of extreme weather events? Next Post Two views on the nature of America’s political problems. Only one leads us to reform. For the past 30 years, the Right has simultaneously been trying to make both “Atlas Shrugged” and “The Handmaid’s Tale” into reality. That the two are nearly mutually exclusive doesn’t deter them one bit. About the only synthesis of the two that makes sense comes from a commenter at Balloon Juice. That’s a great point, that the visions of the Right have deep internal contradictions. Another example are the Evangelical Libertarians, two fundamentally opposed philosophies. On the other hand, that is probably just noise. The carnival barker’s patter. The deep internal consistency lies in the Right’s allegiance to the interests of the 1%. An example of this is the loud claims of to the death fidelity to the concerns of social conservatives, GOP candidates in office tend to pay the little attention. The 1%s economic, regulatory, and national security policies get all the love.